Guess things even out over the course of a baseball season. Phillies began the just-completed road trip with a gut-wrenching loss in Atlanta. The Braves scored three in the bottom of the ninth and then won in extra innings. Yesterday in San Francisco, the Phillies scored three in the top of the ninth and won in extra innings. It certainly made the long flight home much cheerier. Been on five-hour flights after losses. The flights seemed to take forever. So, now the team is back home for a 10-game homestand that starts tomorrow night against the first-place Mets, winners of eight straight. Phillies and Dodgers have played the fewest home games in the NL (6), while the Mets and Astros have played the least amount of road games (also 6). While there is no game listed for today or tonight, some of the players will join Jenn and Chase Utley’s charity event this evening. Proceeds will benefit the Pennsylvania SPCA. The players certainly are huge in community outreach programs. Saturday is a 3:10 FOX telecast. Joe Buck and Tim McCarver will be her. Matter of fact the first four Saturdays of May (1, 8, 15, 22) are on all on FOX. Sunday, Jon Miller and Joe Morgan will be here for an ESPN Sunday Night telecast. ESPN will pick up the Phillies-Cardinals game on next Wednesday. That will be blacked out in the Philadelphia market. So far this season has been a tale of two seasons, well, two different 10-game seasons. Three of those 30 runs have come in the last two games, both losses in San Francisco. The road trip and series ends this afternoon at AT&T Park and it doesn’t get any easier. Cy Young winner Tim Lincecum with his 4-0 record and 1.00 ERA will be on the mound. Phillies have fallen from first place for the first time this season. After 20 games a year ago? 11-9, second place. Who’s in first? The red-hot, much despised Mets, who begin a 10-game homestand on Friday night at Citizens Bank Park. Saturday (FOX) and Sunday night (ESPN) are national telecasts. Chase’s next hit will be his 1,000th. According to the Elias Sports Bureau, the Phillies will become the only National League team in the last 20 years to have five players reach that level. Chase will join Jimmy Rollins, Bobby Abreu, Pat Burrell and Mike Lieberthal. Joe Blanton has a rehab start tonight in Reading. He could be back in the rotation next week . . . Brad Lidge pitched two scoreless relief innings in Reading last night with four strikeouts (35 pitches, 24 strikes). He’s close to being activated, too. Why doesn’t major league baseball have a rule that all teams must put names of the back of uniforms? Yankees, Red Sox and Giants don’t. Then again, one league has the DH and the other doesn’t. Jayson Werth uses the most bats on the Phillies last season, 11 1/ dozen. In the Phillies minors, last week’s pitcher of the week is Reading RH Phillippe Aumont. Player honors: 2B Fidel Hernandez of the Clearwater Threshers. Well, we learned Doc is human. He lost last night as the offense continued to sputter. Shane broke out of his funk which is a good sign. Great front page headline in today’s Philadelphia Daily News: Powerball Winner, with a photo of a smiling Ryan Howard. Good to know the big guy will be a Phillie for a while. Not many 40 homer, 135 RBI guys on this universe. Checking out this date in Phillies history, we have mixed results in playing the Giants. In 1965, we hit six home runs at SF and still lost, 14-13. Then, seven years ago, Kevin Millwood no-hit the Giants at the Vet. Don’t believe Jamie will duplicate the no-hitter. Steve Scarsone, Stockton Ports . . . Jim Morrison, Charlotte Stone Crabs . . . Luis Aguayo, Palm Beach Cardinals . . . Sal Fasano, Lansing Lugnuts . . . Billy McMillon, Greenville Drive . . . Wally Backman, Brooklyn Cyclones . . . Pete Incaviglia, Grand Prairie Airhogs . . . Von Hayes, Camden Riversharks . . . Tom Herr, Lancaster Barnstormers . . . Sparky Lyle, Somerset Patriots . . . Hal Lanier, Normal Cornbelters. Dropping 2 of 3 in Phoenix, the Phillies headed for their final stop on this 9-game journey, San Francisco. Top four hitters in the lineup, Shane, Polly, Chase and Ryan, are scuffling, 6 for 43 for the weekend. Ryan hasn’t homered in 57 at-bats. The good thing, the stats on the back of their baseball cards show they can hit and they will. The tough thing, enemy hitters are batting just .222 against the Giants’ pitching staff, lowest figure in the league. The Phillies lead the NL in runs scoreed, 104. The Giants’ team ERA is 2.78, second best in the league. Giants are 58-32 at home since the 2009 season, third best in baseball. Phillies have the best road record in the NL the last two seasons. Should be an interesting three-game series. Chase is two hits shy of becoming the 32nd player in Phillies history to reach 1,000 . . . Juan Castro is on a day-to-day basis with his hammi; who would have thought that on April 25 we would be starting our third different shortstop of the season . . . Reading RHP Phillippe Aumont pitched 6-hitless innings on Sunday afternoon in 2-0 win over Richmond. He walked 2, struck out 4 and threw 81 pitches in picking up his first win with the Phillies . . . Teammate Domonic Brown, who missed 5 games with a mild concussion after a collision with another teammate, returned to the lineup Friday night and homered. Wednesday night’s game will also be televised nationally on the MLB Network . . . Saturday’s game is on FOX and Sunday’s game is an 8:05 p.m. ESPN Sunday night telecast. In 1980, Steve Carlton set a modern National League record with his sixth 1-hitter, 7-0, over his old team, the Cardinals. Ted Simmons had the lone hit, a single leading off the second inning. 6 no-hitters still stand as an NL record. In 1986, Mike Schmidt drove in his 1,287th run to break Ed Delahanty’s all-time Phillies record. Only other Phillie to top 1,000 RBI is Del Ennis, who finished with 1,124. Weekend in Phoenix is where the Phillies are after taking two of three in Atlanta. Shame because it could have easily been a Georgia sweep. But, two of three works for the rest of the season. Todd Zolecki posted some interesting numbers today in his blog. Didn’t realize we are last in stolen bases and we haven’t homered since last Saturday. Tim Lincecum is pitching tonight for the Giants against the Cardinals. That means we get him next Wednesday. Was hoping we’d miss him. As Todd reported, Scott Franzke and his wife, Lori, became parents for the first time last night, a boy named August. Poor Lori, she now has two male voices to listen to. Today, Rheal Cormier, 43 and tomorrow bullpen coach Mick Billmeyer, 46. He looks older that that. Spent the morning at Triton High School in New Jersey, career day for ninth graders. Golly, they are young. My two World Series rings got everyone’s attention. No need for the bullpen last night. Doc is certainly delivering as advertised. Pitching and leather can win games. While Doc was dominant again, the Phillies defense certainly played a key role in the win. Shane, Chase, Castro and Ryan all sparkled. There were multiple Web Gems in that game. Doc works fast, throws strikes and that helps the fielders behind him. They’re on their toes. When the game moves slowly and pitchers have trouble throwing strikes, fielders are on their heels. Pitchers such as Doc are instrumental in preventing a long losing streak. Oh, there will be games in which he won’t win but over the long season, he’ll win more of his share and end losing streaks, such as the three-gamer last night. Mickey Morandini is 44; Terry Francona, 51. Phillies: An Extraordinary Tradition is a new commemorative 252-page book that showcases the Phillies historic faces and places since 1883. Over 400 photos make for an interesting publication. Fans can pre-order now. It is scheduled for delivery early next month. Will keep you informed. You can pre-order now. Did you know the Phillies once had a female scout? Rich Westcott wrote about Edith Houghton in the book. The thrill of victory quickly turned into the agony of defeat last night in Atlanta. Kyle was awesome and with two out in the ninth, it looked as if the Phillies were home free. Four batters later, the Braves walked off with an extra inning win. Last time the Phillies led by 3 or more runs in the ninth inning and lost was July 16, 2000, in Yankee Stadium, a 9-8. Elias Sports Bureau note of the day. Second straight solid start for a Phillies starter and no wins. An offense that averaged 7.7 runs in the first 10 games of the season is now averaging 1.3 runs during this three-game losing streak. Well, we weren’t going to average 7.7 for 162 games and we won’t be at 1.3 runs per game the rest of the season. Things will get better. Back at ’em tonight with Doc on the mound. That’s one good thing about baseball, you don’t have to wait a week for the next game. Last night is last night and today is today (Did Yogi Berra say that?). Way back in 1898, pitcher Bill Duggleby hit a grand slam home run in his first major league at-bat in a home game against New York. No pitcher has ever matched that. He was 3-3 in 9 games with the Phillies that season. In eight big league seasons, he was 93-102 with a 3.18 ERA. Best note about him was his nickname: Frosty Bill. (A new wrinkle that will appear here every Wednesday). Total number of hot dogs sold at Citizens Bank Park a year ago: 1,140,823. Phillies: An Extraordinary Tradition, the new commemorative 252-page book that showcases the Phillies historic faces and places, will be on sale around May 1. Fans can pre-order now. 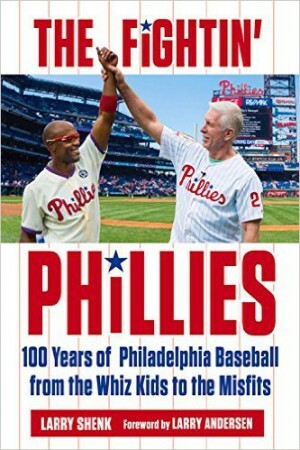 Mike Schmidt wrote the introduction and talked about his relationship with Phillies fans for 18 seasons. Very interesting. John Mayberry of the Lehigh Valley IronPigs and lefty Nick Hernandez of the Lakewood BlueClaws are the Phillies minor league player and pitcher of the week, respectively. Minor League Review will salute a pitcher and player every week. Phillies game in Atlanta on Wednesday night will be on ESPN TV, but blacked out in the Philadelphia market. Comcast SportsNet is carrying the game locally. Of course, you can watch every game on MLB.com, too. Phillies game in Wrigley Field on July 18 has been moved from 6:09 p.m. to 8:09 p.m. for ESPN Sunday Night Telecast. May 2 (Mets) and May 16 (at Brewers) are also Sunday nights on ESPN. More can be added. First Saturday telecast on FOX involving the Phillies is May 1, Mets at Citizens Bank Park. Friendly fan asked what the Phillies use to get dirt and grass stains from the player uniforms. Uniforms are washed after every game, home or road. They are placed on hangers and racks to dry. Former Phillies first baseman and current Marlins broadcaster, Tommy Hutton. He’s 64 but looks 44…..well, sort of. After scoring a league-leading 77 runs in their first 10 games, the Phillies offense could muster only one run in losing the last two home games. Did someone lock the batter’s box and throw away the key? Cole was very good yesterday. If he pitches like that over his next 30 or so starts, we’ll be in a good shape. His performance was a silver lining. Having won the most games on the road the last two seasons and this season (5-1) in the NL, that’s where the Phillies are now headed. Delta charter will leave Philadelphia International Airport this evening. Destination: Atlanta and the start of a three-city, three-time zone journey that ends up in Frisco. Nine games in nine days (seven night games). Cole and Ryan combined for 0 walks and 10 strikeouts. According to Elias Sports Bureau, it was the second time in less than a year that the Phillies lost a game in which their pitchers had no walks and double-digit strikeouts while throwing at least nine innings. Hamels and Chan Ho Park combined to do that in a 2-1 loss to the Orioles on June 21, 2009. Philadelphia had lost only one game under those circumstances over the previous 25 seasons (1984 through 2008). Terry Mulholland had no walks and 14 strikeouts in a nine-inning complete-game loss to the Rockies on June 4, 1993. John O’Neil, who played 46 games at shortstop for the Phillies in 1946 (his only big league taste), turns 90 today. As with all Nonagenarian Club (90 years of age and over) members among Phillies Alumni, we’re sending a jersey (#27) to O’Neil as a birthday present. For those fans in the Lakewood, NJ, area, Joe Blanton makes a rehab start Tuesday night . . . Reading RF Domonic Brown left Friday’s game with a mild concussion following a collision with 1B Tagg Bozied; Brown, off to a .323 start, didn’t play Saturday or Sunday; he’s on a day-to-day basis . . . Interesting note from Saturday’s Mets-Cardinals, 20-inning marathon: number of pitches: 652; time of game: 6:53. 110 years ago the Phillies beat the Braves, 19-17, in 10 innings in Boston, the highest scoring opener in NL history. Braves tied the game with a nine-run bottom of the ninth. This leads to a sales pitch: Phillies: An Extraordinary Tradition, the new commemorative 252-page book that showcases the Phillies historic faces and places, contains a photo of the Phillies taken in spring training in 1900 in Charlotte, NC. Book will be on sale around May 1. Fans can pre-order now. Didn’t think we would go the entire season with one loss. Bullpen had gone 29.1 consecutive innings without allowing a home run until the fateful eighth yesterday. So, we move on to tonight. Charlie’s creed: play one game at a time. May sound boring, but it works. First homestand ends with three games against the Marlins (starting tonight) and then a nine-game trip to Atlanta, Phoenix and San Francisco. Tough trip that ends against that tough Giants pitching staff. Sellout string this weekend should climb from 45 consecutive to 48. Sunday, the Phanatic. Age: Unkown. Pre-game show includes the Zooperstars (Clammy Sosa, Pee Wee Geese, Cow Ripken Jr., Harry Canary, Ichiroach Suzuki, Ken Giraffey Jr., Monkey Mantle and Nolan Rhino). Those mascots crack me up. Cake will be made of Tastykakes. Lucky Phanatic. Today: RHP Jim Lonborg (1973-79), 68 . . . Tomorrow: INF Solly Hemus (1956-58), 87 . . . Sunday: 1B Rico Brogna (1997-2000), 40; OF Jim Eisenreich (1993-96), 51 and RHP Ron Schueler (1974-76), 62. Yikes. Phillies were no-hit on April 16 by Burt Hooton (Cubs, 1972) and Bob Forsch (Cardinals, 1978) . . . April 17, Bill Stoneman (Expos, 1969). 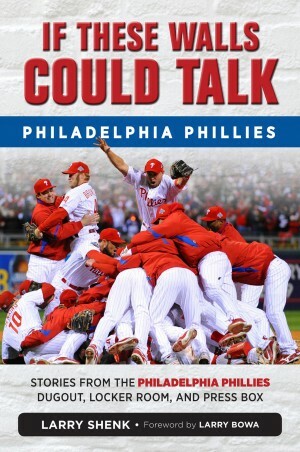 Philadelphia Phillies: An Extraordinary Tradition will be coming off the presses in early May. The 250-page publication (over 400 photos) is a celebration of Phillies history from 1883 through the 2009 World Series.